On the 4th of August 1914 Germany invaded Belgium. The UK, obligated by its defence treaty with Belgium, entered the war on the same day. On the 9th the British Expeditionary Force (BEF) began to move to Belgium and established, together with the French army, a line roughly west-east. The BEF defended the area just north of Mons, with the intention of preventing the Germans from crossing the Mons-Condé canal and outflanking the French. By continental standards the British army was tiny, but very professional and most of it was in Belgium. On the 23rd August, the Battle of Mons began, followed by the famous retreat from Mons, with the BEF guarded, so the legend has it, by the Angels of Mons, said to be the souls of the longbow archers who fought at Agincourt. It was a defeat, but this small force defended strongly enough to delay the German advance, give the French time to regroup and so save Paris and perhaps the war. For 4 years, Mons and its region, an important coal mining area, were under German occupation. By August 1918, however, the allies – strengthened by the arrival of the American army – started a new campaign to break the static lines of the last few years. The “100 day” campaign ended with the signing of the armistice on the 11th of November. 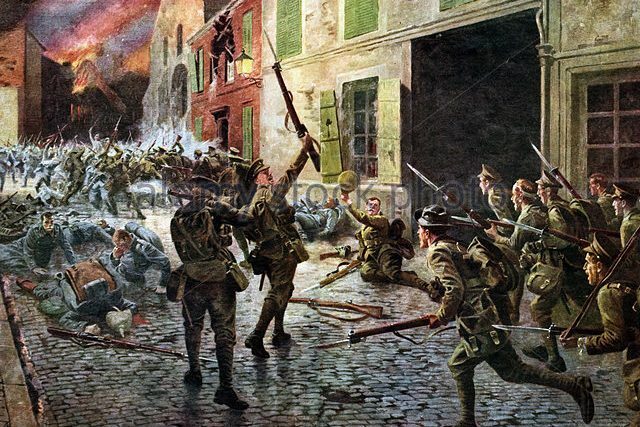 Only one significant city in Belgium, Mons, was liberated, by the Canadians who, without an artillery barrage and thus significant damage to the city, subdued the enemy and liberated the city on the 11th November. In the morning, our coach will take us to the key sites of this early battle. Following this, we will visit the St Symphorien cemetery, established by the German army for soldiers from both sides. It is now a site of the Commonwealth War Graves Commission. Here are buried the first and last allied dead of the First World War. Our coach will return us to Mons, where we will lunch in the Grand Place (restaurant La Petite Provence). Afterwards, we will have a guided walk and description of the last days of the occupation and then the liberation of Mons and the end of the war. Driving directions: From Antwerp or Brussels take the R19 in the direction of Parijs-Bergen (Mons). Leave at Mons Est and follow signs to Mons. Follow ‘Gare’ signs – parking should be relatively easy on the street.